When the Insurance Institute for Highway Safety initiated small overlap testing last year, many cars did not fare well in this test of a cars safety when hitting a pole, a tree or a foot-wide portion of another car’s front end. Now, aside from designating 13 cars that standout as a Top Safety Pick Plus, the IIHS has designated an additional 117 models as Top Safety Picks. What one could deduce from this information? If a vehicle is not an IIHS Top Safety Pick, perhaps you shouldn’t buy it, especially if your kids are going to drive it. If that many vehicles pass this bank of tests so well, what does it say about the ones that don’t? Among the standouts in the Top Safety Pick Plus listing are the Acura TL, Dodge Avenger, Chrysler 200 4-door, Ford Fusion, Honda Accord, Kia Optima, Nissan Altima 4-door, Subaru Legacy and Outback, Suzuki Kizashi, Volkswagen Passat and Volvo S60. This list includes moderately priced cars as well as two luxury models in the Acura and Volvo. The 117 Top Safety Picks have not all been given the small overlap test as yet but achieved the designation based on performance during moderate overlap frontal crash, side impact and rollover, plus evaluations of seat/head restraints for protection against neck injuries in rear impacts. They must score Good in all four of these tests to make the grade, without regard to the small overlap test. "Models that earn Top Safety Pick also offer outstanding protection in many crashes," Lund says. 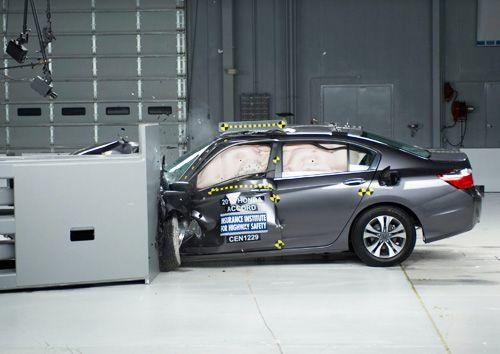 "These vehicles are much safer choices than most vehicles on the market just five years ago." The IIHS is confident the small overlap test has improved safety and protection in frontal crashes since its instigation in 2012. IHS will announce additional Top Safety Pick Plus winners as tests continue. Results for small SUVs are expected in the spring. The small overlap test simulates the results of a front corner collision with another vehicle or an object like a tree or utility pole. During testing, one quarter of a car's left front end strikes a 5-foot-tall rigid barrier at 40 mph. A Hybrid III male dummy is belted in the driver seat. When the IIHS looked at vehicles with good ratings for frontal crash protection in 2009, small overlap crashes accounted for nearly a quarter of the frontal crashes involving serious or fatal injury to front seat occupants. IIHS gives manufacturers advance notice of planned changes in the testing criteria, and automakers are adapting to new IIHS evaluations into their designs. Soon, many more will respond similarly to the introduction of the small overlap test and Top Safety Pick Plus. For example, Honda engineered the Accord to do well in the test, while Ford and Nissan made structural changes to 2013 models already in production. Subaru and Volkswagen changed airbag control modules to assure side curtain airbags would deploy for improved head protection. Automotive safety has been improved not only by enhancements in the test but also in the crash test dummies. Top Safety Pick awards were first given by the IIHS to 2006 models and the testing criteria has continued its refinement since. Good rear test results and electronic stability control (availability) became a requirement in 2007. Good roof strength was made a deciding factor in 2010. Stability control is no longer an issue as it is standard under federal rules for 2012 and later models.